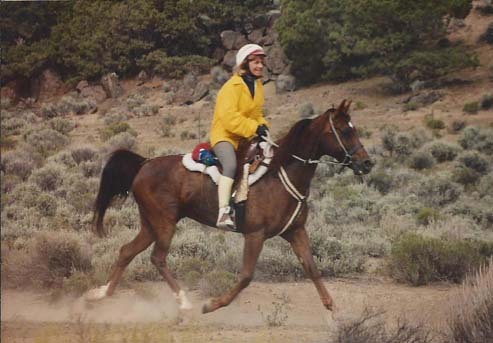 Endurance rider Merri Melde's short essay on the Tevis Cup is featured in the new book, The World’s Toughest Endurance Challenges (Bloomsbury Publishing, London, 2012). 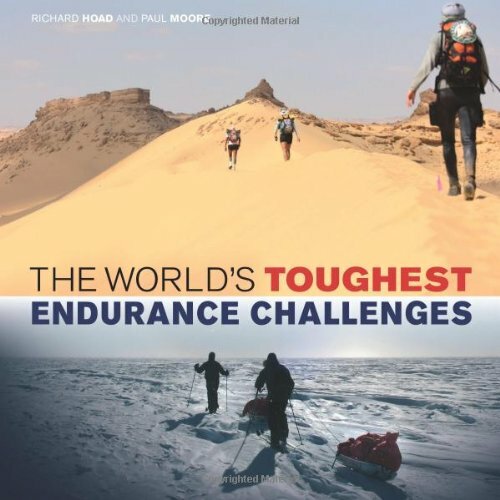 This 208-page illustrated book profiles 50 of the most extreme marathons, triathlons, bike rides, adventure races, climbs, open-water swims and other iconic endurance events from around the world. Her essay is her take on the ride from the athlete's perspective. 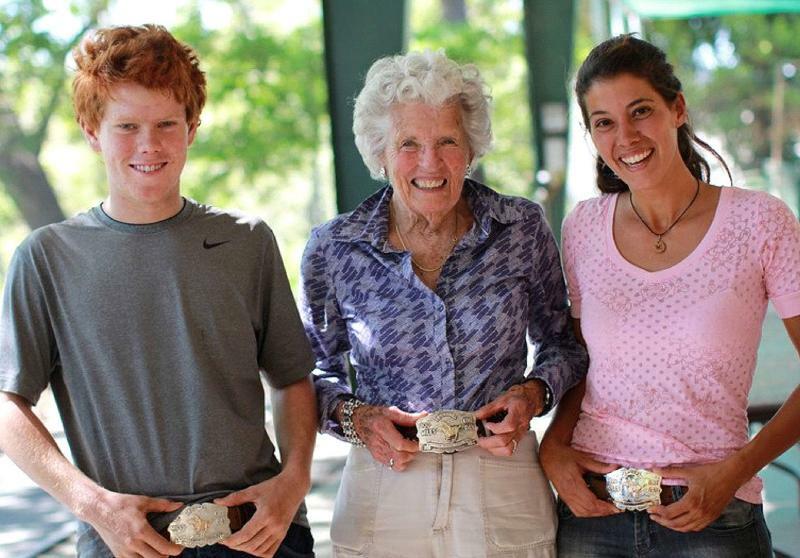 Merri rode and finished the Tevis Cup in August of 2009. The extraordinary adventure is chronicled in detail her blog, "Merri Travels" on Endurance.net in the July and August 2009 archives. Tevis and endurance riding have been part of Garret's life from childhood through today. The opportunity to ride Tevis as a junior in 1984 changed his life and, in many ways, guided him towards a career in the horse industry. 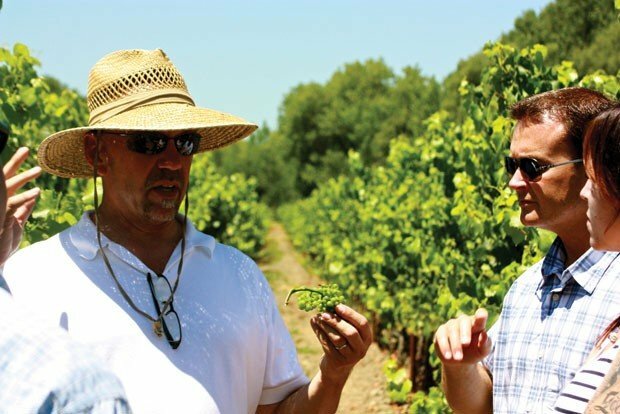 Garret's goal as a Tevis Board Of Governors member is to make sure the event continues and our children have the opportunity to be shaped by the event in the future. Jenni is a big fan of the Tevis Cup - She's tried it nine times on seven different horses and has seven buckles to show for her efforts. Jenni brings a solid marketing background to the WSTF BOG - Nestle, PowerBar, Mother's Cookies and Clorox are featured on her resume. These days she's responsible for brand marketing at Ariat International, which she refers to as "the mother ship". Jenni's excited to be inducted onto the board and looking forward to learning how the foundation functions and what's involved in putting on such an amazing, historic ride. Mark your calendars for the next big event from the Western States Trail Foundation. the first weekend of June 2013 promises to be an event the whole family can enjoy. The Foresthill Mill Site, a regular vet check for Tevis, will be base camp for the combined Educational Ride and the Fun Ride from Thursday, May 30th through Monday, June 3rd. 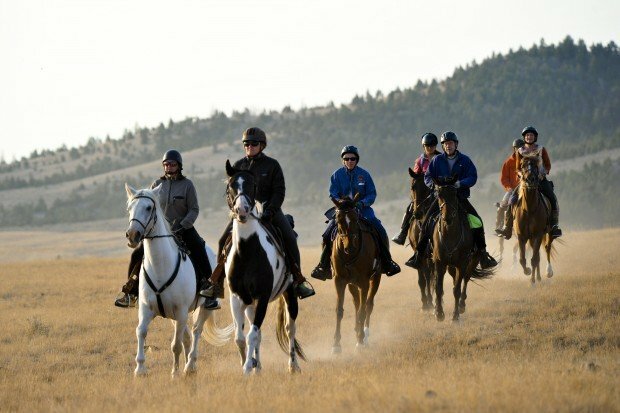 Hosted by the WSTF Educational Committee, participants will enjoy camping, riding, camaraderie, dining, educational lectures, access to experienced endurance veterans, Tevis mileage credit, campfire music and more. The educational ride will offer a new format to give more personalized attention to participants. The Fun Ride is also offered both Saturday and Sunday for those who prefer a more relaxed weekend in the same environment. 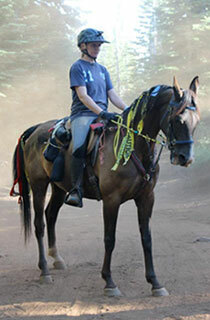 Colleen Morgan of rural Spooner completed her first 50-mile endurance ride on Saturday, Oct. 13. The ride was held at the Ukarydee Campgrounds and Castle Rock Horse Trails near Arkdale (Wisconsin). The ride was held under adverse weather conditions with temperatures not over 45 degrees and with more than 3 inches of rain falling during the ride. The ride was hosted by the Midwest Distance Driving Association and sanctioned by the Upper Midwest Endurance and Competitive Rides Association and the American Endurance Rides Conference. Adequan® is once again supporting the American Endurance Ride Conference with Title Sponsorship of it's banner National Championship event. 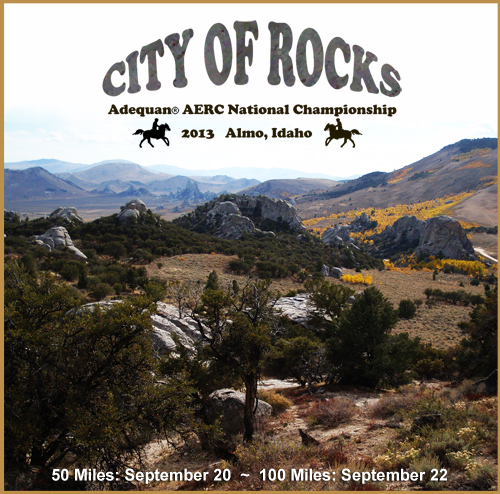 The 2013 event will be held in the spectacular City of Rocks National Reserve outside of Almo, Idaho. 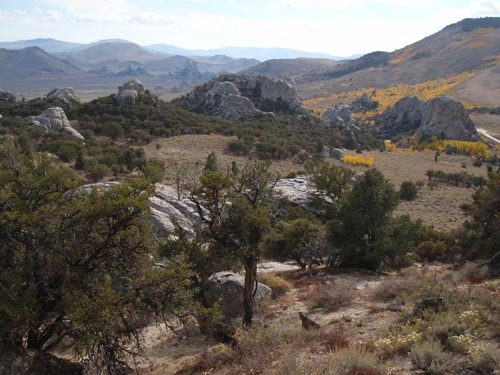 The high elevation trails and natural beauty of this area will make for a memorable event. Additional sponsors to date include Vettec, Easycare Inc, Endurance.Net and Drinkers of the Wind Arabians. Friends of Sound Horses (FOSH) is pleased to announce the first distance recognition program for gaited horses beginning in 2013. The Gaited Distance Program promotes FOSH Sound Principles by recording mileage of the gaited distance horses competing in veterinarian sanctioned, endurance, limited distance or competitive trail events and recognizes, honors and rewards the work of that horse. Each year’s program will run from January 1 through December 31. The Gaited Distance Program rules and forms are currently available at a newly developed FOSH website for individuals wishing to register their horses for 2013 competition. Both registered and unregistered gaited horses are eligible for participation. The website is open in advance of the January 1, 2013 start date to allow visitors to view the site and offer comments. Champion endurance racer Darolyn Butler has made an equestrian career out of her passion for marathon rides. Darolyn Butler has had a long career in several aspects of the equine industry, from winning rodeo queen pageants to selling Western wear and producing instructional videos on horsemanship. Today, she has knitted her love of endurance riding into a company of teaching clinics, leasing horses and training other endurance racers. From her ranch, Cypress Trails Equestrian Center north of Houston, Texas, she runs her family business, conditioning endurance horses while leading adventure trail rides and giving riding lessons. Butler also uses her distance riding skills to serve the community. 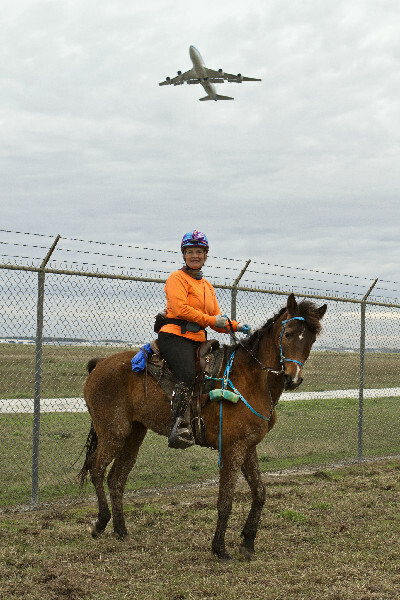 She helped form the Airport Rangers group at George Bush Intercontinental Airport (IAH), a unique program enabling fellow equestrians to enjoy hundreds of miles of pleasure trails while patrolling the vast airport grounds. Butler began endurance riding at 31, when a trainer told her she should hurry up if she wanted to try it. 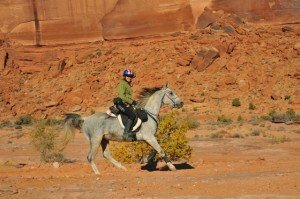 Now 62, she has competed all over the Americas and on several continents in FEI endurance races. She has earned dozens of wins, including gold and silver medals, and has over 34,000 competitive miles under her saddle. Triangle Ranch Communications is proud to announce the release of the first book written specifically for beginning endurance riders. Endurance 101: a gentle guide to the sport of long-distance riding is told in a comfortable narrative style with plenty of informative stories and photos. Storms uses the lessons she has learned in ten plus years of competition and combines them with practical advice from other experienced endurance riders. Endurance 101 enables new endurance riders to make better decisions when choosing a horse and tack, and to make good choices when feeding, conditioning, and competing with a novice endurance horse. Riders seeking a straightforward, easy-to-read book will love Endurance 101’s mix of narrative and practical, step-by-step advice on everything from packing the trailer to keeping their horse sane, sound and safe through the conditioning process. Storm’s enthusiasm for her chosen sport will rapidly infect newcomers, and even experienced riders will be look at their riding and training routines with fresh eyes. You won’t want to miss taking a ride in the company of Storms while dodging her nemesis, the Bad Idea Fairy, along the trail. Laugh and learn. Endurance 101 is the book you’ve been waiting for. 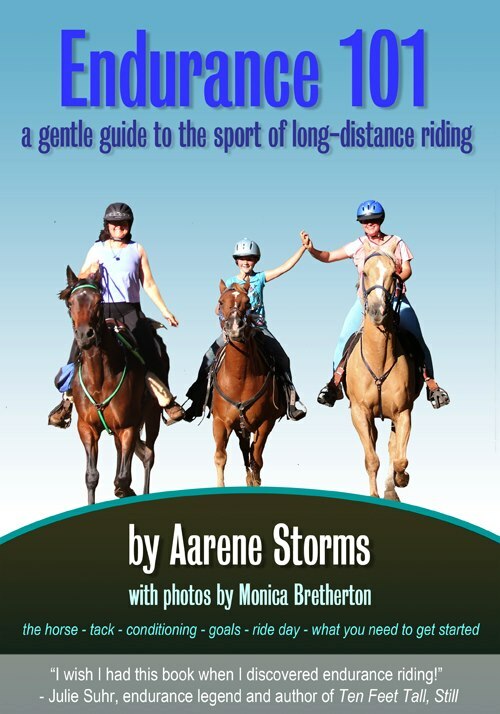 Author Information: An advocate for Junior riders, equestrian trails, and novice endurance horse and rider teams, Aarene Storms has published numerous articles in Endurance News and other equestrian sport publications. She has completed more than 2000 AERC miles on several horses, and currently competes on a tall, opinionated Standardbred mare called Fiddle. 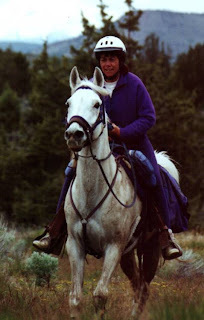 Her adventures in the saddle and on the ground are documented with tongue firmly in cheek at the Haiku Farm blog. Photographer: Storms recruited a fellow blogger and rider Monica Bretherton and her stockpile of photos to help bring endurance riding to life. From post-ride grins to the intricate details of endurance tack and ride rituals, the images help to draw the reader into the world of long-distance riding. Publication Information: Anticipated release date for the ebook edition is October 31, 2012, to be available from Amazon.com and other e-book retailers at the price of $9.99. A print edition to follow shortly thereafter, price to be announced. When Janet Kirkpatrick tells you she has "legs of steel," believe her. 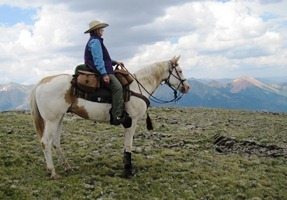 The 74-year-old sticks out a well-toned gam -the result, she says, of the time she spends in the saddle. "You're standing up the whole time," Kirkpatrick says. "And I think it helps the back, too." She should know. 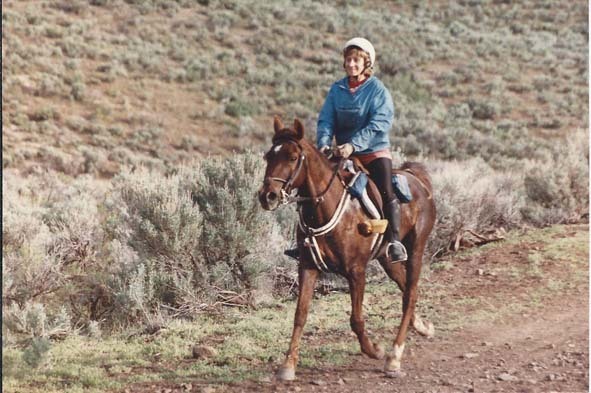 A horse enthusiast her entire life, the Huntington County woman discovered endurance riding - a sport in which horse and rider race to finish trail rides of 25, 50 or 100 miles - in 1984. 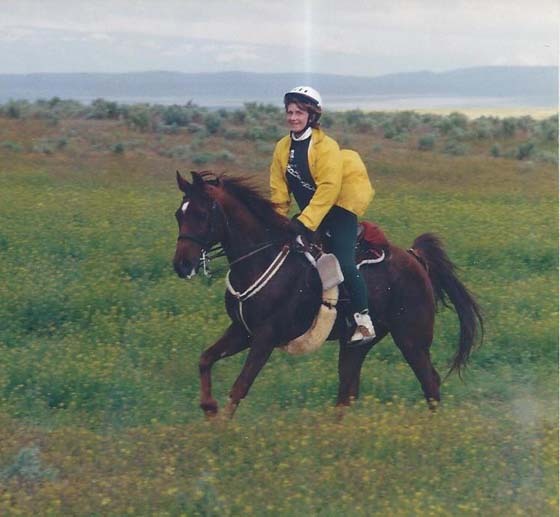 Fifteen years later, she became one of an elite group of endurance riders to log 5,000 competition miles on the same horse. This summer, Kirkpatrick repeated that feat - piling up another 5,000 competition miles on a second horse. "To do it on one horse is very unusual," she says. "To do it on two separate horses is just a dream." In actuality, Kirkpatrick says she's probably accumulated three times her official miles - if you count in all the miles she's logged in training and just for pleasure. "In the beginning of the year, I put in probably 300 miles just getting him ready to roll," she says. Kirkpatrick's current equine companion - a purebred Arabian officially known as H.A. Highfire but answering to Booker - came into her life shortly after the unexpected death of another Arabian named Butch. She and Butch had accumulated 6,168 competitive miles between 1990 and 2002, when the horse suddenly became ill and had to be euthanized. "That was the longest night of my life," she says of Butch's death. "I held his head. I always told that horse I'd never let him hurt." A friend connected her with Booker, an unbroken 4-year-old who "had never been out of the field he was born in." Another friend got Booker used to having a rider on his back, and Kirkpatrick spent some time playing with the horse before taking him to the woods for their first ride. A cowboy preacher form North Texas who set off in July to ride around the world to publicize horse abuse has ridden into a social media dust storm. A vigilant Facebook posse of horse and long-distance riding enthusiasts are dogging CW Cooper's every move after he lost two horses to injuries, including one that broke its leg on a cattle guard and had to be shot last month near Alamogordo N.M., in the first 600 or so miles of his marathon ride. Mounted on his sixth donated horse, Cooper, a 53-year-old air conditioning repairman and one-time country musician from the Parker County town of Bluff Dale, has doubled backed into West Texas. He's also dumped the notion of trying to make it around the globe, and dropped the horse abuse angle. He now says he's simply in the saddle for God. "I prayed about it and the Good Lord said let's go to Texas and spend the winter there. Apparently he has work for me to do in Texas," he said Friday. Cooper, who spoke from the trail by cell phone from somewhere around Seminole, said he plans to ride until the "Good Lord tells me to stop. "My whereabouts right now are unknown, brother," he said, in hopes of eluding the online tail which managed to have him checked out by the Gaines County Sheriff's Department on Thursday. More than a thousand people in a Facebook group are tracking him on the "Stop the ride of Carl Wayne 'CW' Cooper" page. Since Oct. 5, they have been sniffing out his trail, discussing his horse troubles and questioning the shifting reasons for his ride as well as his claim of being an ordained minister of the Cowboy Church in Springtown. "He just continues to prove that he is willing to risk the health and well-being of these horses to justify his own personal ambition," said Colleen Parmenter Hamer, a long-distance rider from Blair, Neb., who started the Facebook group. Cooper's digital trackers have also called him out on a whale of a whopper. While trying to gin up support in what he once proposed as a five-year ride around the globe, Cooper posted online that he was a widower who lost his wife to cancer. But his wife, who once managed his band, is very much alive. They're still married but "more than estranged," he admitted. "I did that before I was ordained and I forgot about it. I didn't want people to know my business. If you say you're a widower they tend to leave you alone." Cooper's ride has been rocky since he set off from Springtown on July 23. Anywhere from 100 – 400 endurance riders and their horses are expected to gather today in the Choccolocco Management Area in the Shoal Creek Division of the Talladega National forest just north of Heflin for the annual Alabama Yellowhammer Endurance Horse Ride. Horses, from mules to Arabians, and their riders will begin today with timed 75-mile, 55-mile and 30-miles events near Coleman Lake throughout today and Friday with a 10-mile “fun ride” on Saturday. An endurance ride is a marathon for horses across distances from 25-100 miles. The distances normally offered are 25, 30, 50, 55, 75 and 100 miles. Twenty-five milers have a maximum of six hours to complete, 30 – seven hours, 75 – 12 hrs, 55 – 13:15 hrs, 75 – 18 hrs and 100 – 24 hrs. The ride is a run over a pre-marked, pre-measured trail. Trails are marked with color coded ribbons and directional arrows. Trails that will be used after dark will be marked with glow sticks. Each evening there is a briefing for the riders about the trails they will be following and the procedures they are to follow during the next day’s ride. There are designated checks every 12-20 miles where the horses must stop and be examined by veterinarians and rest, drink and eat for a pre-determined time before continuing on the next leg of the ride. There are timers at the vet check location to officially release riders onto the trail and to record what time the riders come off the trail into a vet check. The vets examine the horse for signs of lameness, heart rate, dehydration, etc. to make sure the horse is fit to continue. If the horse is judged not to be fit to continue, the horse and rider are not allowed to continue. Each evening after the ride, every horse/rider team that completes the ride with a sound and health horse within the maximum time limit gets a completion award. The Western States Trail Ride, also known as the Tevis Cup, is widely considered the toughest endurance ride in the world. The trail follows part of the original Pony Express route through 100 miles of steep canyons, rocky pinnacles, sheer drop-offs, and deep forest in the Sierra Nevada Mountains. Competitors have only 24 hours to complete the ride so it’s not surprising that only half finish successfully. Endurance riding is not a race. The challenge is for a rider to finish with a horse who is judged “fit to continue”, which means he is mentally, emotionally, and physically ready to keep going. Veterinarians make sure that happens. The Tevis has more vet stops per mile than any other endurance competition. As fall begins and temperatures slowly drop, the number of confirmed equine West Nile virus (WNV) cases around the country continues to rise. According to the U.S. Geological Survey disease maps, 364 cases of equine WNV had been confirmed at last update (Sept. 25). The current case total is the highest since 2007, when 468 horses were confirmed WNV-positive. The current total will likely rise, as mosquito season is not over in many parts of the country. Iowa, Kentucky, Louisiana, and Virginia have all confirmed WNV cases recently. Iowa--The Iowa Department of Agriculture and Land Stewardship issued a statement Sept. 28 indicating more than 20 horses in that state had tested positive for WNV thus far in 2012. The statement reported only one case was confirmed in Iowa in 2011. "Horse owners are encouraged to make sure they get their animals vaccinated and keep the vaccination up-to-date," Bill Northey, Iowa secretary of agriculture, said in the statement. "The cases we are seeing are in horses that have not been vaccinated or are not current on their vaccinations, so we are encouraging owners to talk to their veterinarian and make sure their animals are protected." Kentucky--Kentucky animal health officials confirmed an additional case of equine WNV, according to a Sept. 28 statement from Kentucky Equine Programs Manager E.S. "Rusty" Ford. What's it like to train for and ride in endurance races? How can an interested rider get started in this discipline? Kelsey Kimbler, an endurance rider sponsored by Kentucky Equine Research, shared some information about her favorite sport. 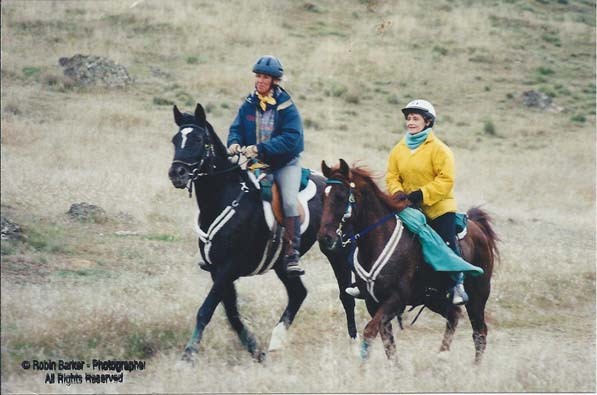 When did you start riding, and how did you become involved in endurance riding? My sister Kirsten, the oldest of us four girls, got Winnie, our first Arabian. Winnie was five years old and Kirsten was ten. She started showing at local Arabian horse shows and decided she wanted to show at the regional and national level. We started adding horses, and I began showing in walk-trot when I was eight. In 2004 I was the Canadian National Hunter Pleasure Walk-Trot Champion with my horse SR Diamond Lakota. Kirsten and my dad started endurance in 2003 after reading an article in the Arabian Horse Magazine about the Tevis Cup. That article ignited a spark that led us down this endurance path. After a few years of dividing our time between endurance and showing, we decided to focus on endurance! 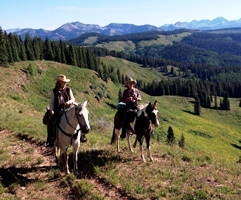 We love riding together as a family and spend our entire summers traveling to endurance rides. Who are your influences in the sport? We were very fortunate to cross paths with our family's mentor, Canadian rider Myna Cryderman, in our earliest days of endurance. She lives relatively close to us, about six hours straight north. She is still a great friend and mentor but somewhat retired from competitive endurance, choosing to go at a more leisurely pace now with her granddaughter Lyric, who is just getting started in the sport. I was also truly blessed last summer to get to train with John Crandell who won Tevis the two times I was there. I learned so much from him during that time, and I was able to ride his horse Motyf at the North American Junior Young Rider Championships (NAJYRC) last year. When I applied for the World Championship, I asked if he would consider coming to groom for me and my horse Cody and was so grateful when he agreed. NEWMARKET, UNITED KINGDOM — Margaret “Meg” Sleeper, who was a last-minute substitution, was the highest placed American at the Longines FEI World Endurance Championship on Saturday, Aug. 25. The day started out pleasant at Euston Park, but throughout the day the weather deteriorated into heavy downpours and severe thunderstorms. Due to the extreme weather, officials had to call the race off for the safety of the horses and riders. In an unusual finish to an endurance race, several riders were placed based on the position they were in at the time that the race was called, but the majority of the riders finished the sixth and final loop. Sleeper finished 11th but since she was riding as an individual, her score did not count toward the team score. The team finished fourth. Friends and family of an injured horseback rider from Cool have come together to bring her ranch up to snuff before she comes home this weekend. Crystal Costa's ranch has been alive with activity the last few days as neighbors, friends and family work to make her home handicap accessible. Costa, 50, of Cool, was thrown from her horse while she was training in July for the Tevis Cup near the Francisco's checkpoint. Her horse was startled when a passing mountain biker's wheel slid out in loose gravel. The fall broke two vertebrae in Costa's back, her eye socket and her nose. The mountain bike rider, Jon Hyatt, of Granite Bay, was in fifth place in the Tahoe-Sierra 100 at the time, but he stayed with Costa until help arrived and has visited her in the hospital since then. Costa has been in recovery at a San Francisco rehabilitation center since her fall, but has not regained her ability to walk, according to her friend and neighbor, Dan Schafer. He said she will be home from the center by Saturday. "Her attitude is as aggressive as ever to get back on a horse," Schafer said.